Why Is Rubio in the Gang of 8? So it’s a confusing battle space that has anti tax activist Grover Norquist on the same side as liberal Senator Chuck Schumer, and moderate, establishment Republican columnist David Frum on the anti amnesty side while traditional conservative columnist Charles Krauthammer is pro amnesty. On the talk radio side the views are more what you would expect, Rush Limbaugh and Mark Levin are reliably anti-amnesty, however Sean Hannity switched sides after the election and now supports amnesty (although he is still cagey about it). Otherwise, things are more what you would expect from a conservative split on immigration. The neo-cons are pro amnesty (think William Kristol) and the paleo-cons are anti (think Pat Buchanan). So where does that leave Tea Party darling Marco Rubio? Square in the middle. Rubio is a real conservative. I’ve listened to enough politicians talk to know when they are the real deal and when they are just using the conservative movement to advance their own careers *cough* Newt Gingrich* cough. 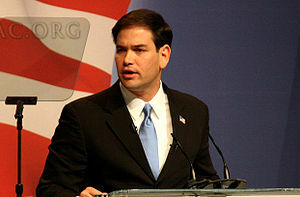 Rubio has long been a supporter of some variation of the Dream Act, which are a series of proposals to legalize illegal aliens brought over as children. Given that as children they didn’t really have a choice about crossing the border illegally; it’s fairly easy to make the moral case to anti-amnesty conservatives for creating some mechanism for them to stay, after border security. But it was a shock when he joined in with a group of liberal Senators and pro-amnesty Republicans, the Gang of 8, to craft a comprehensive immigration bill. According to Mr. Isaacson, Jobs “stressed the need for more trained engineers and suggested that any foreign students who earned an engineering degree in the U.S. should be given a visa to stay in the country.” The president reportedly replied that this would have to await broader immigration reform, which he said he was unable to accomplish. A simple bill to allow graduates of US schools to get a Visa would enjoy large bipartisan support and would pass easily. So therefore we can’t allow it until we make sure we drag 11 million other people along with them! So now Rubio is stuck riding this tiger all the way to completion. Meanwhile, his reputation will be marred by every little crazy line item that is stuck in the bill, such as the one creating a biometric data base of all US adults. So why would he join in with the Gang of 8? How could this benefit him? + He knows it won’t pass and just wants to build up some “moderate cred” for 2016. + He’s inexperienced and doesn’t realize that Schumer and his gang are taking him for a ride. + He’s extremely experienced (a former Speaker of the House in the Florida legislature) and he’s playing the Gang of 8 by trying to “cooperate” up to the point that he can exploit the weaknesses of the bill and then blame the Senate Democrats and the Obama administration for sabotaging the bill with poison pills to keep the bill from passing and keep it as a political issue. I’m sure there are probably many more possible reasons, but I don’t see any way for this to end well for Rubio’s political future other than at some point he disowns the bill. If he doesn’t and ends up voting for whatever monstrosity slithers out of the Senate, than Rubio’s reputation will be damaged. To conservatives, he will be a traitor, and to liberals he’ll be a gullible fool. Which pill will he choose? The red or the blue one?